The transformation of the University of Baltimore's Robert L. Bogomolny Library respects the memory and history of the original library design while simultaneously modernizing it to meet contemporary research, scholarship, archival and environmental demands. The building, situated at the prominent intersection of Maryland Avenue and Oliver Street, has immediate visual connections to Penn Station and other important landmarks on the UB Campus. The original massing concept of the Library is substantially maintained – that of the “floating box” housing all of the library’s treasures. To the west of the building, the space formerly occupied by an auditorium is now a new academic and public space with the addition of a Glass Hall. The geometry of this addition differentiates the new construction from the existing building while retaining the elemental simplicity of the original floating box. The Glass Hall addition created on the west façade of the original building commands a significant presence along Oliver Street and signals a new intervention in the life of the building. It creates a new entrance on Oliver Street, an important pedestrian link between the newly completed University Bookstore and the John and Frances Angelos Law Center. The Glass hall and the urban plaza that form around its base populates the new pedestrian way with vibrant public amenities that signal the University’s commitment to developing a strong and welcoming urban presence. Inside, the Glass hall promotes interior circulation, brings daylight and views into the original floor plate, and creates new informal study and meeting perches within its enclosure. Such spaces reappear on the library floors as well, acknowledging a new era of library use that privileges learning and interaction. 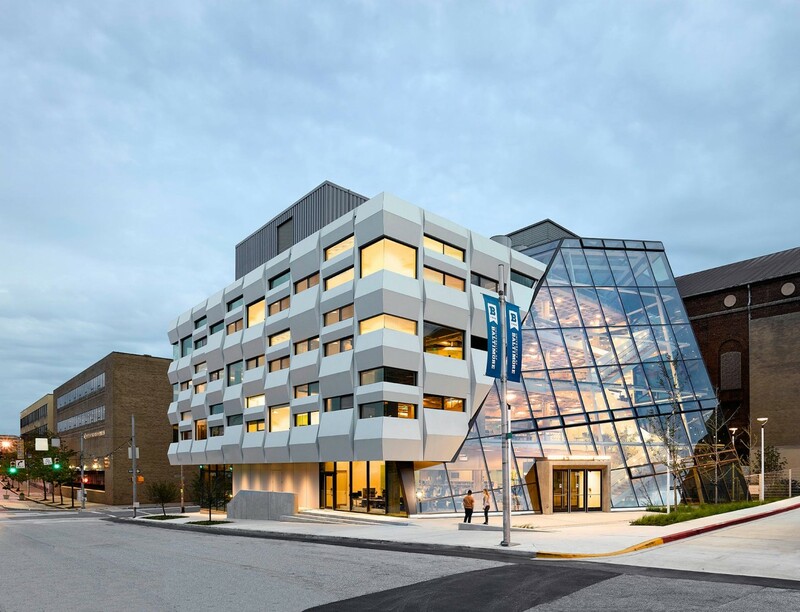 With extensive interior glazing and flexible layouts, the life of the library as a key node in the University of Baltimore network can be ensured. This strategy minimizes the impact of the renovation on the building structure, which is nearly all maintained for the accommodation of the library program, and minimizes the risk of costly modifications to the existing two-way waffle slab. 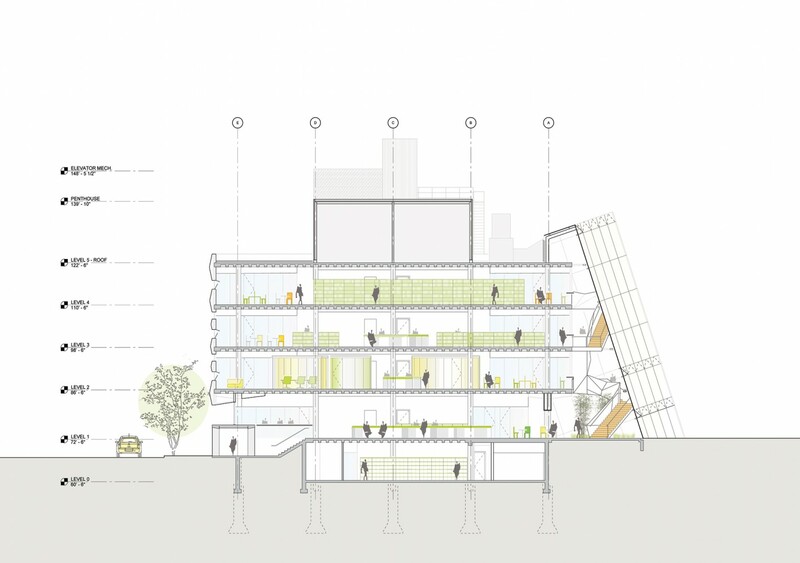 The organization of program spaces on the existing library floor plates places stacked spaces towards the interior zone of the floor, between the cores, to mitigate any impact of sunlight on the printed material. 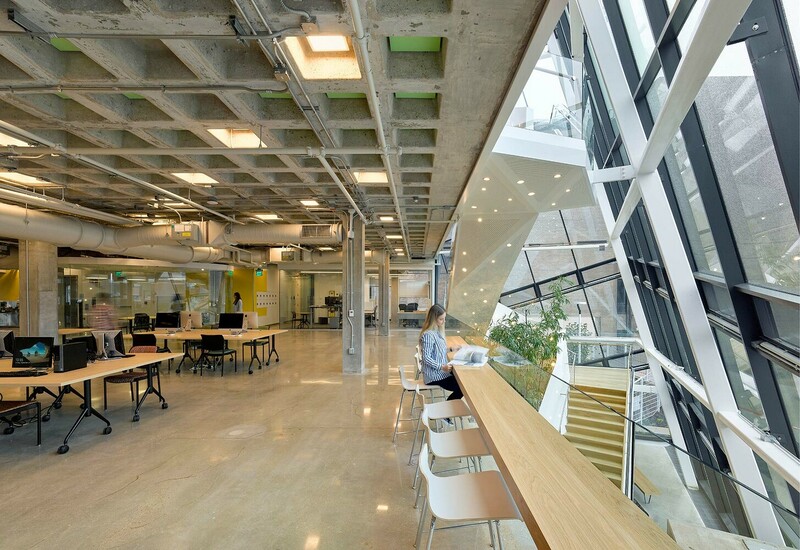 This also preserves perimeter floor space for more regularly occupied functions that are able to take advantage of the daylighting as well as the natural ventilation afforded by the new upgraded façade. Offices, study rooms, and informal work areas that occupy the eastern portion of the building benefit from access to Maryland Street and views toward Penn Station. 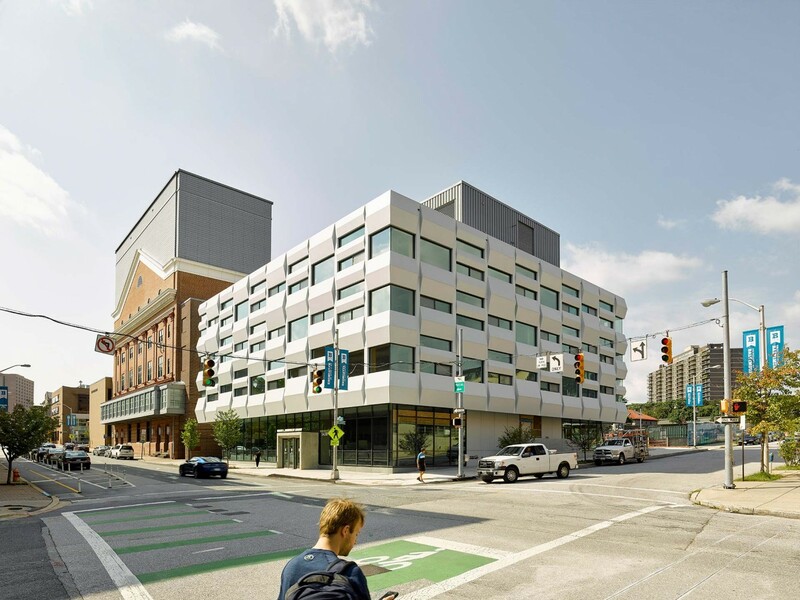 These spaces along the western façade have direct connection to the new Glass Hall with its ample daylight and open circulation, as well as views west along Oliver Street towards the Fitzgerald Building and MICA. As far as possible, interior partitions are glazed to maximize visual transparency and transmission of daylight. 5.388 qm / 58,000 sq.ft.